Carrie McClelland comes to the tiny Scottish village to write about Slains, the local castle that played an important role in the Jacobite uprising of 1708. Carrie hopes to use the crumbling ruins in a historical fiction novel she is writing, but ends up writing a completely different kind of book when she finds herself overwhelmed by someone else’s memories. Nineteen-year old Sophia Paterson comes to Slains castle after her parents die on a sailing voyage. She finds safety and comfort with her aunt, the Countess, who is playing an active role in bringing the exiled King of Scotland back from France. Sophia finds herself embroiled in a plot that is doomed to fail. 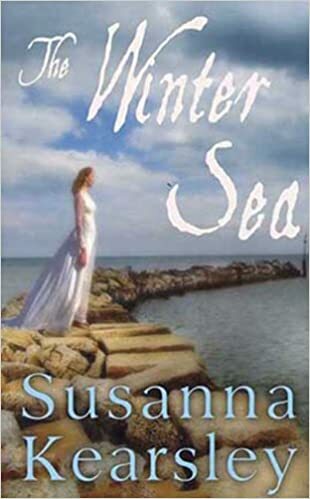 This is my first novel by acclaimed author Susanna Kearsley, and I can see why she is so popular. Her writing style is comfortable and familiar, and she incorporates complicated historical elements in a way that is easy to understand. It is obvious that she has done a great deal of research on the Jacobite uprising and the castle of Slains. I can certainly say that I now know a lot more about the deposed King James II and those who sought to restore him to the throne than I did before reading this novel. Generally, when an author splits the plot of the book between two characters in different time periods, one of them is going to be more well-developed than the other. That ends up being the case here, as the novel-within-a-novel that is Sophia’s story is far more interesting than Carrie’s plotline. I think Kearsley even began to understand that, since after The Winter Sea hits the halfway mark less and less time is devoted to Carrie’s narrative. The descriptions of the harshly beautiful Scottish coastline poked my inner travel bug pretty hard. Might have to start looking into a trip to Northern Scotland. Perhaps I’ll stop by Slains castle while I’m there. You can find The Winter Sea here on Amazon or here on Book Depository. Note: This novel was later released under the title Sophia’s Secret. No idea why as The Winter Sea is a much better name. Amidst the turmoil of World War II, Madeline Hyde’s husband Ellis and his best friend Hank randomly decide to venture into the highlands of Scotland in search of the Loch Ness Monster. Both men have been deemed medically unfit for the army, Ellis for colorblindness and Hank for flat feet, but that does not stop the glares and whispers when people see them out of uniform. When they reach a tiny Scottish village and check into the local inn, Ellis and Hank begin acting secretive and wild, drinking all day and well into the night. Frequently left behind while her husband is off monster-hunting, Maddie gets to know the locals and struggles to remember who she is outside of her marriage. Author Sara Gruen is best known for her wildly popular Water for Elephants as well as the tragically underrated Ape House. For her most recent novel, Gruen dives into one of the most famous and enduring legends, that of the Loch Ness Monster. However, anyone going into At the Water’s Edge expecting to be thrilled by exploits of monster hunting will be tragically disappointed. I would estimate that nearly 75% of the novel takes place in the small hotel where Maddie and her husband are staying. 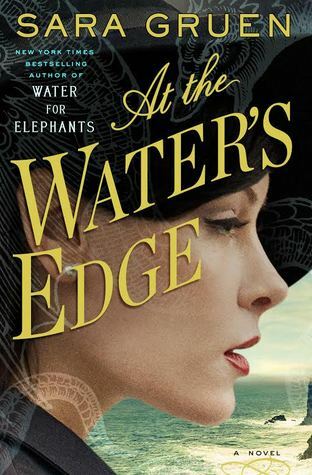 This is not to say that At the Water’s Edge isn’t an interesting book with an intriguing plot line, but I did spend a fair bit of time wondering when the hunt for Nessie was going to get underway. Despite the intense lack of creatures from the deep, the plot of the novel is carried along by the force of Maddie’s character. She is a woman who finds herself married to a man she barely recognizes, one that does not seem to respect her or take her feelings into consideration. Ellis goes from being merely immature to downright repugnant over the course of the novel. Luckily there is a strong and honorable innkeeper available to catch her eye. Gruen takes advantage of the stereotypical Scottish male that has been romanticized by novels such as Outlander. Angus is strong but possesses a gentle heart. He provides for his fellow man in times of scarcity without asking for anything in return. He is a war hero with a tragic backstory. You can probably fill in the rest of the blanks from there. I couldn’t decide how I felt about the romantic angle in this book. In some ways it comes about naturally enough and doesn’t feel too forced. But on the other hand, why is it in novels that the beautiful but tragically unhappy heroine manages to find her strong and valiant protector in literally the first male she meets after realizing she is unhappy? It’s so utterly predictable that as soon as Angus was introduced and described, I made a note in my book journal: “obligatory love/savior”. That said, I couldn’t help but rooting for Maddie as she struggles to fit in with life in a small Scottish village. I’ve always loved Sara Gruen’s writing style, she is compellingly readable and my mind sunk into her narrative without a moment’s hesitation. You can find At the Water’s Edge here on Amazon or here on Book Depository.